A few years ago, having destroyed a long line of supposedly-indestructible dive watches, I decided to buy a watch that might survive more than a couple years of my decidedly non-extreme outdoor activities. I could claim that I was following Captain Samuel Vimes 'Boots' theory of socioeconomic unfairness (stating that it costs more money to be poor because you can't afford goods that will actually last longer), but mostly I was just sick of breaking watches. Also, I decided a nice watch would be my present to myself for a recent promotion to Lieutenant. The one I bought cost me (and it still pains me to admit this, because it seemed and still seems like unsupportable luxury) about $300. Years later, it remains unsmashed, almost completely unmarred. At this rate, I will likely recoup my watch-replacement costs in a couple more years. But that's beside the point. I didn't know it at the time of purchase, but my watch is one of a controversial class of timepieces which are "homages" to far more expensive brands and iconic designs of past decades. The actual mechanisms used in these watches are very similar, in some cases the same, but they cost a fraction of their four-figure forebearers. Homage watches are adored as affordable and stylish by some horologists, and despised as knockoffs by others. 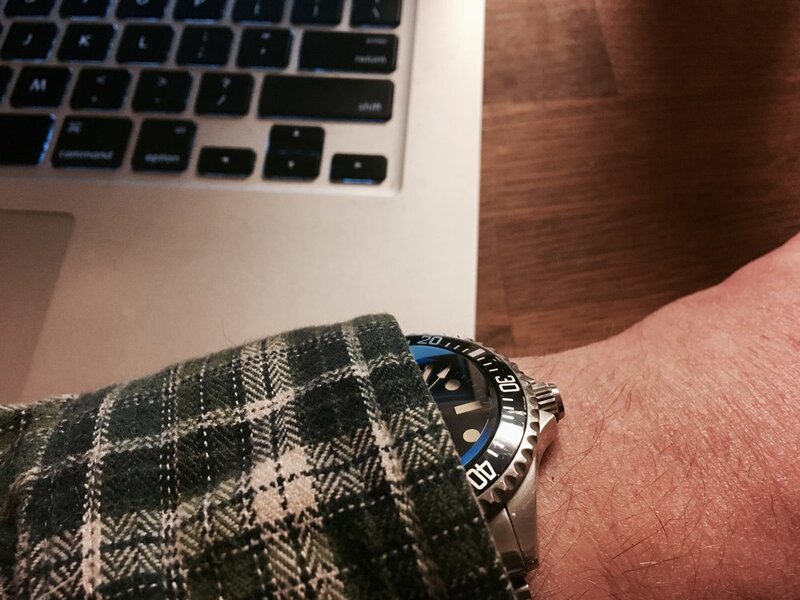 I recently read an article [Steinhart Ocean One Black and the case of the Homage Watch] that explores this divide. Outright hostility towards homage watches is easy to find in articles, reviews, and on discussion boards. It is based on accusations of deceit – on the part of the manufacturer and the wearer. The company who makes the watch is being dishonest by copying an iconic design they had nothing to do with creating and the wearer is being dishonest in trying to achieve or borrow the look (and status) of the iconic watch without having the authentic original in hand. Viewed from this perspective, this is an issue of authenticity, of protecting the creative work of people who developed revered designs. On the other hand, inexpensive variations can be seen as a direct response to the artificial scarcity of the originals, homegrown alternatives to products that are out of reach to normal people. Should I be prohibited from having a decent-looking, tough wristwatch because I don't meet desired income requirements? When something like the Steinhart comes along – at around 5% the cost of a new Submariner – the boundaries of these categories can seem under threat. How does one justify the Rolex without exposing the artificial foundations that underpin some of the higher-end brands? The debate arises in any industry in which a curated inner circle comes under threat by an unmoderated group of outsiders without heritage or "name recognition" to function as social currency. It's a bit like indie publishing, or fan fiction. My watch is Tolkien fan fiction. I use this particular example because I have a friend who writes very good fan fiction set in Tolkien's Middle Earth. It's painstakingly integrated into the original timeline, and tends to explore the backgrounds of relatively minor characters whom she found interesting. It has its own voice, but the bones of the world are not her own. Her work relies on the creative vision of another author. I'm certain many people would see it as a cheap knock-off, but I actually enjoy her work as much as Tolkien's. If this offends you, cast me into the fire. Her stories are non-commercial, and her homage doesn't compete with its inspiration, in the same way I was never going to buy a Rolex. She has used the strengths of the format and found new routes through the staid tone and characterization of the original text. In our economic system, authenticity is a commodity like any other. Selling it for less is a threat to anyone with an investment in the brand name version. As a result, two groups of people who appreciate the same thing - watches, stories - find themselves at economic odds.